Ask Ken: How did you start cycling? I wondered when you started riding your bike? How did you get interested in bicycling? Despite the fact that my kids think my original bicycle wheels were carved from stone ala Fred Flintstone, my first bike was a Schwinn when I was about 13. I’m digging around trying to find some pictures of it. My parents bought it for me to make it easier to deliver The Southeast Missourian. It had a massive front basket to hold the papers, a big headlight that put out minimal light, fenders (with mudflaps) and a battery-powered horn. Interestingly enough, even though my route kept me out after dark, I don’t recall having a taillight. It DID have reflectorized tape all over it, so maybe that’s what kept me from getting run over. In the early days, a lot of the streets I delivered to were gravel, which didn’t make it any fun going UP or DOWN the steep hills on a single-speed bike. I can remember a couple of times when the streets were covered with snow and slush that ice built up on the fenders between the fender and tires. The more you rode, the more water that was thrown up and the more the ice built up. That wasn’t so bad as long as you were moving, because the friction of the moving tire would melt the ice. When I stopped once, though, I found out that the tire was solidly frozen into the mess. I had to leave my bike at a customer’s house and continue the route on foot. After getting my driver’s license, I didn’t do much biking until we moved to Florida in the early 70s. Some combination of about 20 of us would jump on bikes and cruise up and down the Florida East Coast from Boynton Beach to Singer Island, stopping from time to time to jump in the ocean to cool down. We were casual, social riders and not hard-core athletes. 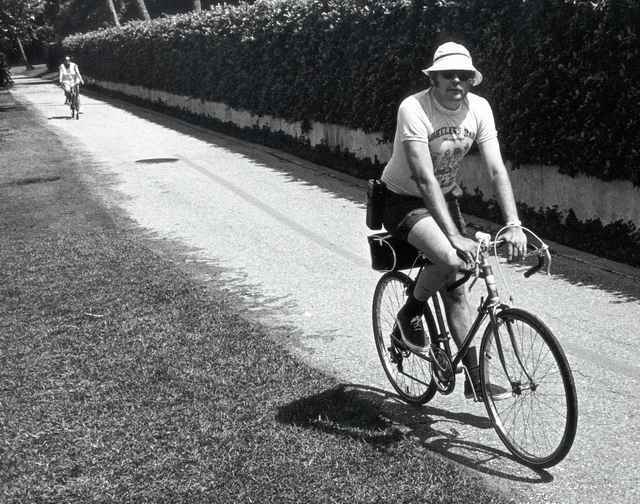 The picture above was taken on the Palm Beach Lake Trail bike path around 1974. Wife Lila is in the background. Let’s see, I was wearing blue tennis shoes with dark socks, a floppy white hat, a Wheeler’s Bar Million Dollar Log T-shirt and a Motorola brick two-way radio. The bike was equipped with a huge bag hanging from the saddle and a compressed air air horn like you’d find on a boat. Sounds pretty much like my outfit today. I spent a lot of time working on stories in Immokalee, including shooting folks on Wheeler’s Bar’s Million Dollar Log. Frame No. 26 on this page shows a couple of guys on The Log. I’m going to launch a new site shortly that will have photos from MO, OH, NC and FL that I took when I was working for newspapers in those states. When I get around to publishing more photos from Wheeler’s, I’ll make sure to drop you a line.